I asked Annie if she wanted to come into the stroller with me and she refused! The thunder was a bit loud for my signature ears, but what scared me was the lightning! BearHUG & RosyPoodleKisses! oh Rosy, you have to feel sorry for Annie this time. She looks miserable. She better check the Meteo on the Internet before leaving home next time. I did feel bad for her especially since it got even worse for her when we got home -- she had to have a bath ! The weather did not predict at all - even while storm was happening it said partly cloudy! BearHUG & RosyPoodleKisses! She looks so sad & bedraggled. We're going to pool our allowances and start saving for Annie to have a stroller, too, or we could send Shadow's red rain poncho. It even has a hat. There is a weatherman in Chicago whose official title is Vice President in Charge of Looking Out the Window. Maybe he needs to move out West? That is so sweet of you! 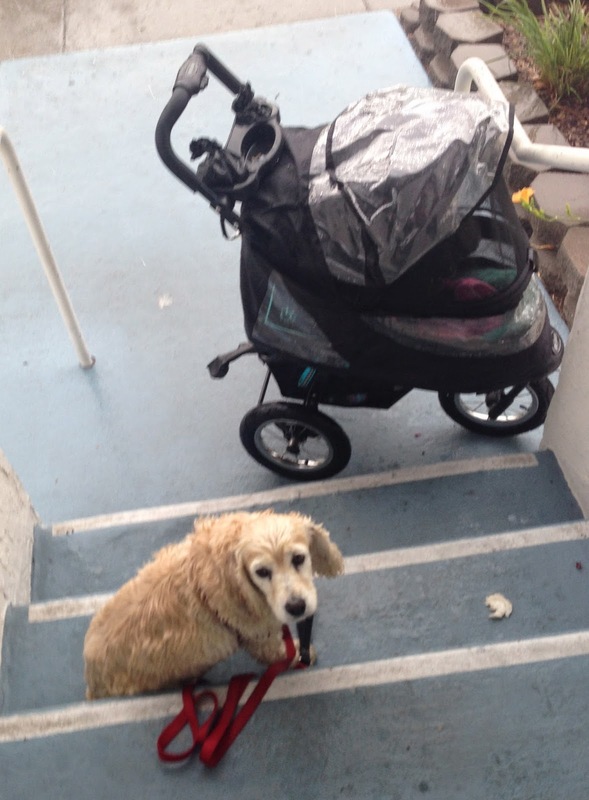 Don't waste your money -- Annie wants nothing to do with a stroller. One time Mommy put her in and she jumped right out! She does have a raincoat, we just didn't have it with us since the forecast was sunny! Mommy predicted it the day before because of her weather knee! BearHUG & RosyPoodleKisses x8 +3 ! Annie, believe it or not I’m a complete wreck when it's storming out...I hide in the farthest corner of the basement with my sister Rockford. I'm not a huge fan of thunder or lightening either. I wish I was there to protect you, but most likely I would have done the "hidey" thing behind you. Can you ask Rosy where your mom got her stroller from, I want to get one for Rockford now, she is 14 and having a hard time walking…do u think they make them big enough for an old Husky girl? Love and Licks, your man Bosco.